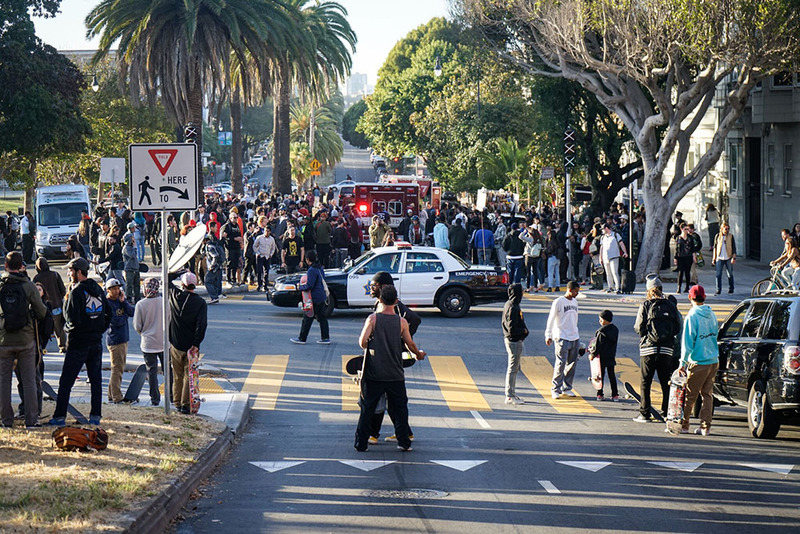 A skateboarder who clashed with police at Dolores Park last July has sued the city for alleged “malicious and reckless actions” by a yet-to-be-named SFPD sergeant who caused him to fall off his skateboard and flip over the hood of a police car. “Mr. Economus suffered a broken ankle, torn knee ligaments, a sprained left hand and a gash which required 13 stitches to close,” the lawsuit states. Indeed, video of the July 11 incident shows Economus riding at a high speed down Dolores Street toward the sergeant and a patrol car. The officer appears to hold out his arm and cause the skateboarder to lose his balance and tumble over the hood of the car. “Incredulously, the Police Sergeant failed to go and check on Mr. Economus’ well-being, despite the young man lying on the ground, battered and bloodied in obvious pain,” the lawsuit says. “The fact that a commanding officer, a supervising officer, was behaving this way in broad daylight in front of spectators is indicative of his comfortability in doing this,” Adante Pointer, Economus’ attorney, told the San Francisco Chronicle, which first reported the lawsuit Wednesday. “The way other officers responded, [it] appears this isn’t something that raises an eyebrow, even,” he said. Pointer noted that Economus, a Vallejo resident, “no longer skateboards like he used to” because of his injuries stemming from the incident. John Cote, a spokesperson for the City Attorney’s Office, told the Chronicle that his office has not yet received the lawsuit. The clash between skateboarders and police began as an unauthorized “skate bombing contest” but quickly spiraled out of control, lasting several hours and resulting in at least two injuries of skaters, vandalized police cars, and police using less-lethal firearms against skaters, according to reports. Economus got what he deserved: “Nyah nyah, we can close down streets and you stupid cops can’t do anything while we speed by you really cl — ow! Waaaa why didn’t he help me? !” GTFU. It’s the ultimate chutzpah for a bonehead skateboarder barreling down Dolores St, totally illegally, gets injured when a police car blocks his path, and then SUES the city. That reminds me of the guy who robbed a bank, then got hurt when he was pinned against the wall by a car pursuing him, and sues the pursuer. In this case, the skateboarder got exactly what he deserved, but instead of owning up to their stupidity, he and his equally boneheaded supporters look for a scapegoat for unlawful, extremely dangerous behavior. I see these skateboarders barreling down Dolores every day as if there are no cars on the road and no pedestrians on the sidewalks. It’s ALL THEIRS, and screw everybody else. I hope the judge throws this ridiculous lawsuit in the trash where it belongs and gives the entitled skateboarder a good spanking. I also never see cops stopping and citing the skateboarders for reckless endangerment, one of so many laws that are simply not enforced in this “anything goes” city of ours. Dude, like, skateboarding is just such a cool way for grown-ups to commute. Nah, it’s actually a pastime for children. LOL at people past the age of majority who think a “skate bombing contest” gives them control of city streets. Great. SF Citizens foot the bill for SF cops stupidity. No matter what your feelings on skateboarding and the bad attitudes or sense of “ownership of the streets” these kids often display, they don’t deserve to be clothes lined by an officer of the law. The city deserves to be sued until the can put law enforcement officers in place that act with some common sense and can enforce the law without harming the citizens. This officers opening move was to clothesline a 19 year old kid, breaking his ankle and tearing ligaments and then walk away ? What if this was your kid,hanging out with his friends -doing something stupid and this happened. I don’t like the rowdy actions of some skateboarders any more than you do but the first 2 posts come off sounding selfish and compassionless.